One of the challenges about tabling at a convention is that you almost can't do it by yourself. Sure, you can sit there and sell books and make change and sign autographs and do sketches yourself, but at some point you're going to have to leave the table. Even if you bring tons of food in a cooler that you have with, you're going to have to take a bio break at some point! And if you don't have a partner there to watch over your table while you're away, you wind up having to ask one of your table neighbors. (Side tip if you didn't already know this: make friends with your table neighbors!) So, in general, you want to keep your table absences to a minimum particularly if you're tabling solo. But sometimes things come up and you need something away from your table. I saw this weekend Alex Heberling post about a clever (I think) solution. 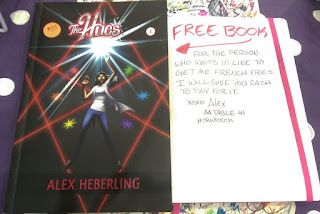 Basically, she put note on her table offering a free copy of one of her books to anyone willing to go stand in line for her and pick up some french fries. She was still paying for the fries, so the book was just so she didn't have to leave her table. She had about six or seven people stop by, curious about the offer, before someone took her up on it. It was less than an hour between when she put her sign up, and when she had fries and a soda sitting in front of her. Now, when I asked her about it, Heberling said it felt a bit like "holding a cardboard sign on the exit ramp of a highway." I suspect that was mostly because she had a hastily crafted hand-written sign, and it wasn't something she planned on doing. But I think that, if you approached it the right way, it could work as a marketing tool. What if, instead of leaving a hand-written note quietly on your table, you had something actually printed up? Something that was in the same style as the rest of your table materials? You wouldn't leave it out all the time, of course, but pull it out maybe around 11:00, and make an announcement of it. "Free book if you bring me food!" One of the other things Heberling noted was that several of the people who stopped by had their attention grabbed by the "free book" notion. Who doesn't like free stuff, right? There's a catch, of course (getting food for you) but you've hurdled two important challenges: you've gotten their attention, and you've given them an built-in discussion starter. A lot of people are introverts, and some people are too shy/nervous to come up and ask you about your book. Or maybe they just don't want to engage too much if they're unsure. But this starts the conversation, and gives you the opportunity to not only get some food without having to wait in those sometimes horrendous lines but also sets you up to give a quick sales pitch about your book to someone who might not have even stopped by your table! Heberling seemed a bit uncomfortable with the idea, but I also know her to be somewhat shy about that kind of thing too. She suggested it would be easier for "someone with a higher charisma stat". But with the right attitude and approach, I think this could be easily turned into a marketing schtick. It gets word about your book(s) out to those who aren't already familiar with you in an environment that's already primed for people ready to buy. And because it's rare to see someone do this (at least for now) you'll likely generate a little buzz as well. I think the key, from a marketing perspective, is being able to sell the idea. You'd need some level of carnival barker-ism to make this effective. But, then again, don't you need some level of carnival barker-ism to table in the first place? One final note: since she was kind enough to let me borrow her photo and answer some of my questions about her experience, I said I'd plug her current Kickstarter campaign for The Hues volume III. I've already read books one and two, and have contributed to her campaign here as well. It's a good story, and worth checking out if you're not familiar with it already.